I love tractors. The ones that tickle my fancy are not the modern, all singing and dancing behemoths, but the ancient spluttering, characterful ones. This beautiful Ford 4000 belongs to George’s Dad and proved yesterday that not only is it very handsome but it is also very useful. I believe it to be about the same age as myself, so of a fine vintage and in its prime. We are in the process of revitalising the outside spaces at the farm and surrounding the holiday cottages including rebuilding beds and borders. Mr and Mrs G have spent the last 4 years working very hard, renovating the cottages and setting up their new business. Now it is time for the outside spaces to be whipped into shape and that is where I come in! At present the grounds are mainly adorned with old and poorly-pruned shrubs, on the whole hydrangeas and fuchsias, long past their ornamental best. There is also an awful lot of pampus grass, seemingly loved by the previous owners and is being removed as a priority. This project is significant venture but we are plodding on, one day at a time, and though most of the work has been carried out in rain/hail/storm/gale it has been great fun. Hard work but plenty of laughter and at times very bizarre and I do enjoy a bit of the bizarre. A bonus of course are the animals, which I love, top of the list being George the philandering kunekune boar. I have noticed, however, that they are beginning to give me that “not her again with her silly voice and no food” look! Yesterday, as part of the revamp of an area adjacent to the office, a substantial post needed to be removed in order to install new gravel board. There was nothing for it but to call International Rescue. It didn’t take long before Thunderbird 4000 trundled, at a modest but elegant rate, to the rescue. The post was expertly impaled onto one of the prongs and the admiring audience gasped to see it effortlessly lift out of the ground, and keep lifting, and keep lifting! The resultant hole was at least 4ft deep with water in the bottom, I could have sworn I saw a kangeroo bobbing about down there. I did suggest a new business venture “Ye Olde Wishing Well” but it didn’t go down terribly well. For safety it was quickly filled with bits and pieces hanging about. 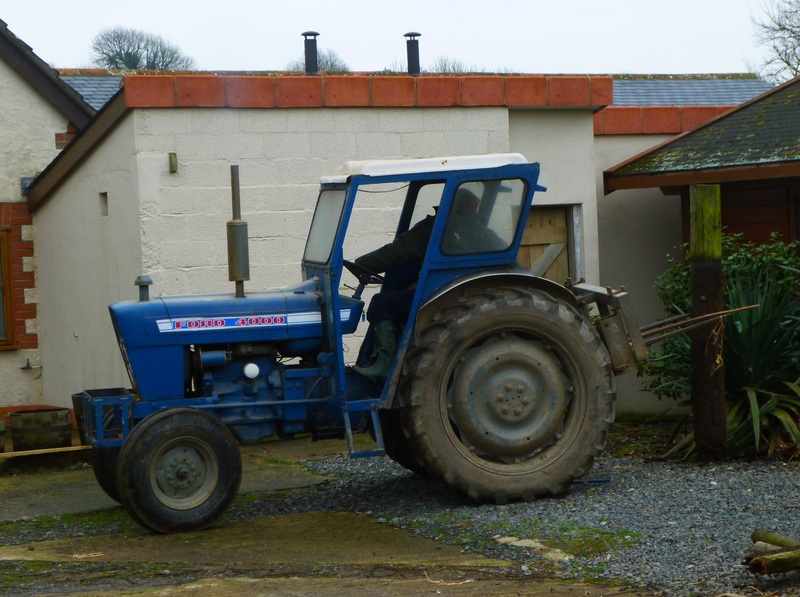 Now where did that chicken go …..
We had a handsome, vintage aged lighter blue tractor at our previous home across the country. We long for the use of it now that we no longer have it. 🙂 Your ‘bizarre’ gardening sounds like fun to me. Sounds wonderful, one day we will all drive about on tractors instead of racing about in fast cars. So much more civilised but perhaps a little noisy! Tractors are a delight, no matter what your age, especially a lovely blue one. I’ve had to remove some large “ornamental” grasses, but I didn’t have any heavy equipment. A strong lad did the job. I thought I had replied to this one but it seems to have disappeared, forgive me if I repeat myself. I think I said something like “a strong lad is a very fine substitute”!